A broad spectrum antibiotic that aids in the treatment or prevention of Ornithosis, Mycoplasma, Wet Nostril, Respiratory, E-Coli/Paratyphoid, Bacterial infections and more. 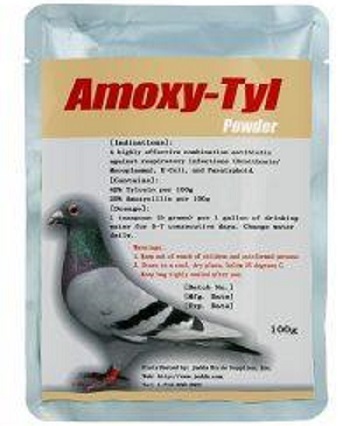 Add one level teaspoons of AMOXY-TYL to one gallon of clean drinking water for 5-7 consecutive days. Use as bird's only source of drinking water. Use fresh solution every day. If bird does not respond to treatment or if bird's condition worsens, consult a veterinarian. Keep stock solution covered in a dark refrigerator and discard after five days. Keep container closed before and after use. Store in a cool dry place.